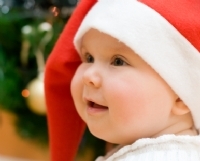 'Tis the season for making merry, and if this is your baby's first holiday, it makes the festivities all the more enjoyable. But as excited as you may be to dress your little one up in that Santa sleeper, this time of year may not be so fun for a new person who's not used to the blinking lights, crowded stores and—to borrow a phrase from The Grinch—"all the noise, noise, noise." If you'll be hitting the road to visit family and friends this month, parenting pundits agree that less is more. "Just take the essentials: a portable crib, car seat and feeding supplies," says Dr. Ari Brown, an Austin,Texas-based pediatrician and co-author of Expecting 411. Better yet, call ahead to see what hotels can provide you with to cut down on your packing. "Most have crib rentals, and you can arrange to have diapers and other gear shipped or delivered to your destination," offers Stacy DeBroff, CEO and founder of Mom Central Consulting. If you'll be taking to the friendly skies, take advantage of pre-boarding since carry-on compartments fill up rather quickly, advises Maureen O'Brien, a parenting coach at destinationparenting.com. "Dress in layers versus bulky clothing since newborns don't regulate their temperature very well and can get overheated," she adds. While you may be tempted to break from routine with your little one, experts caution against it. "Irregular sleep and eating habits, coupled with a change in scenery and excitement of being around new people, can lead to some pretty grumpy behavior," notes Brown. Stick as close to your baby's regular naptime as possible. If you'll be changing time zones, O'Brien suggests adjusting baby's schedule by slowly shifting it closer to your destination's timeframe. "Be on the lookout for signs of exhaustion like fussiness and tantrums," adds DeBroff. Factoring in some quiet time can be just as important as seeing the holiday windows at Macy's, or opting for an earlier bedtime instead of attending Midnight Mass. For nursing on the go, Brown recommends packing a smaller handheld breast pump. Formula-fed babies can feast on powdered brands, but she advises doing a test run before traveling if your little one is used to liquid formula. When bottle-feeding away from home, ask hotels if they can sterilize bottles in their kitchen dishwasher. "Most are happy to accommodate you," notes DeBroff. Babies eating solids will benefit from pre-packed snacks of Cheerios and other low-sugar finger foods. If you'll be traveling with an older sibling, keep mealtime transitions to a minimum, such as drive-thru eating rather than sit-down. "It's hard to get a cranky child back into a car seat," notes O'Brien. Chances are you'll be attending a holiday gathering over the next few weeks and if you'll be bringing baby along, be wary of guests who want to hold your little bundle of joy. Protecting a newborn against germs during cold and flu season is a must, so it's perfectly okay to steer clear of any sneezing friends or asking your husband's favorite aunt to refrain from kissing your baby's face or hands. If your little one has begun to show signs of stranger anxiety (around 6 months), be mindful of passing her around to unfamiliar faces; save that for the pigs in blankets. If there's a Christmas tree in sight, watch out for little hands. "The colors and appealing nature of decorations will be like a magnet to young babies who will reach out to anything they see," says O'Brien. In your own home, be sure to stick to non-breakable decorations big enough to fit through a toilet paper roll, so they won't pose a choking hazard. And when it's time to put the decorations away, you'll want to reinstate all outlet covers for a safe and happy New Year!